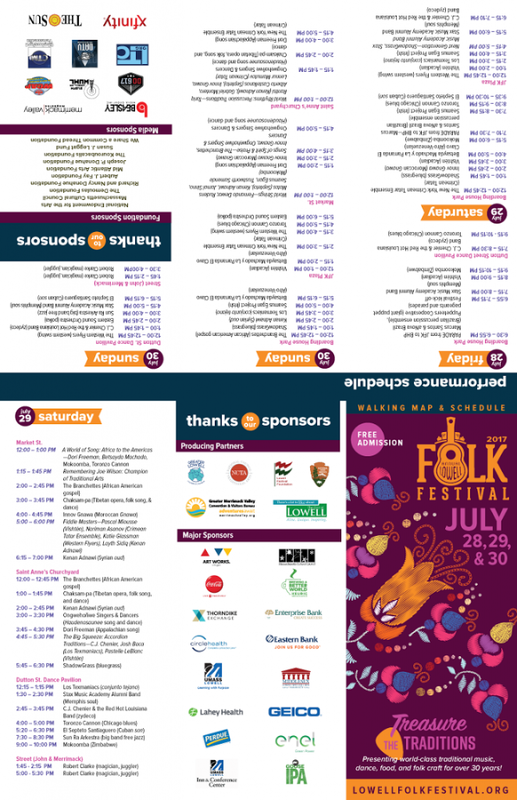 Lowell Folk Festival: 32 Years of Folk, Food, Family and Fun! 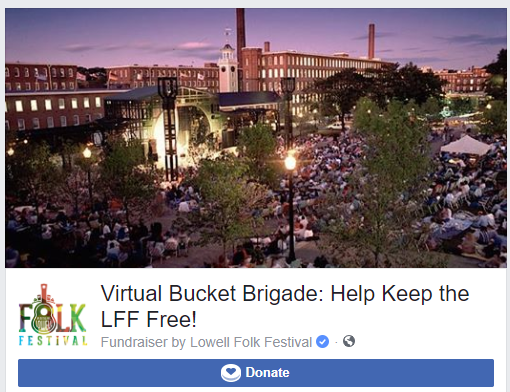 When is the Lowell Folk Festival? Who’s coming to this year’s festival? I am a traditional or ethnic musician. How can I sign up to be a performer? Should I attend rain or shine? Are pets a part of the Festival? Where can I get information while at the Festival? Who is the contact for Information about vending during the Festival? Who has performed at the Lowell Festival through the years? July 27-29, 2018. The Festival is held the last full weekend of July annually. Following the success of hosting the National Folk Festival in Lowell for three years, 1987-1989, the producing partners and community continued the excitement with the Lowell Folk Festival in 1990. With hundreds of thousands of visitors attending annually, the experience is ever-changing. The six producing partners: The City of Lowell, the Lowell Festival Foundation, Lowell National Historical Park, the Greater Lowell Chamber of Commerce, the Greater Merrimack Valley Convention & Visitors Bureau, and the National Council for the Traditional Arts have continued organizing and presenting the Festival annually during the last full weekend in July. The National Folk Festival started in 1934 in St. Louis, MO. Since 1989, the National Folk Festival has continued to migrate around the country to Johnstown, PA; Chattanooga, TN; Dayton, OH; East Lansing, MI; Bangor, ME; Richmond, VA; Butte, MT; and Nashville, TN. The 2015-17 National Folk Festivals are held in Greensboro, NC. Most of Downtown Lowell becomes Festival grounds for the three days of the Festival. With five performance stages, some folks settle in for an afternoon or evening at one stage. Others move around according to the schedule to experience the various venues, performances, and audiences. There are sunny and shaded stages, and there will be smiling faces all around. With a Family Activities Area, Crafts Demonstrations, savory ethnic foods, and so much more, everyone enjoys it “their way”. The performances and activities within the Festival are FREE. Food, beverage, and merchandise sales are available throughout the Festival. Friday evening: Kicking off with a dance parade at 6:00 p.m., the concerts are at Boarding House Park Stage and the Dutton Street Dance Stage from 7-10 p.m.
Sunday: from noon to 6 p.m. at five stages. Schedule of performances will be poster closer to festival dates. Each year the Festival hosts diverse performers from all over the country and the world. Check out this year’s Performing Artists page for details on who will be on stage. The National Council for the Traditional Arts (NCTA), one of the Lowell Folk Festival producing partners, books artists for the festival performances. If you’re a traditional or ethnic musician and would like to be considered for future festivals, check out NCTA opportunities and the list of open gigs on Sonicbids (check the “closed gigs” for guidelines and details on previous folk festivals). Applications are typically due by the end of March each year. Your assistance would be greatly appreciated at the Festival. Several ways in addition to volunteering… The Festival is always accepting additional sponsors. Click here for more information. If you’d like to donate to the Festival, click here. … and thank you for your support! The Lowell Folk Festival is attended by kids of all ages. In addition to the fantastic music throughout the Festival, there is a crafts demonstration area, a family activities area, Destination Lowell venue showcase, and much more. The whole family will have a great time! Massachusetts in late July can bring lots of different weather, and of course we’re keeping our fingers crossed for sunshine and cool breezes. However, to be realistic the temperatures average in the mid-80s, and the sun can be intense … so hats, sunscreen, and water are valuable for your comfort. There is also the chance of a sudden thunderstorm – venue changes will be announced from the stages if necessary. The Festival carries on, whatever the July weather brings. Venue changes are announced from the stage when necessary. Blanket or towel to sit upon in the grassy amphitheatre. You may bring low lawn chairs, but please be considerate of those sitting around you. If you’re blocking someone’s view, we’ll ask you to move. A sweater, sweatshirt, or windbreaker, for the evening concerts. Extra spending money, for a souvenir t-shirt, CD, and raffle tickets for a chance to win an exciting raffle prize! All Festival venues are accessible for wheelchairs. Wheelchair accessible restrooms are available at the National Park Visitor Center, Boott Cotton Mills Museum, Downes (John Street) Parking Garage. Sign language interpreters are part of the performance at the Boarding House Park Stage and other selected stages. The Festival is a busy place, and the setting is not the best for pets. However, if you must bring your dog, it must be licensed and leashed, comfortable with active crowds, cleaned up after, and please have water available regularly. The Festival is easily accessable by car or public transportation. Click here for directions by car or train. Absolutely! Some folks come long distances especially because of the amazing variety of ethnic foods available from non-profit organization vendors throughout the Festival. From African to Filipino there are tastes from around the world and good ol’ American fare as well. Click here for information about food sales at the Festival. There are plenty of places to stay in and around Lowell. Contact the Greater Merrimack Valley Convention and Visitor Bureau. View our Places to Stay page. There are marked first aid stations throughout the Festival venues. Parking is available at City of Lowell garages for $10-15/car. Please note that downtown streets are re-directed and closed for the Festival. Three-day parking passes for the whole festival are also available. More details on the Directions and Parking page. You bet. Dancing is encouraged throughout the Festival, particularly at the Dutton Street Dance Pavilion. Information booths with friendly Lowell Ambassadors are situated around Downtown Lowell. The city Ambassadors would be glad to provide you with information once you arrive at the Festival. Information is also available at the National Park Visitor Center at 246 Market Street. Commercial vending is restricted during the Festival. If you are a commercial vendor who would like information about permits during the Festival, please contact Henri Marchand, City of Lowell Special Events Coordinator, at (978) 674-1481 or by email at hmarchand@lowellma.gov. Check the map for restricted commercial vending areas during the Festival. From Route 495 (Exit 35C) or Route 3 (Exit 30A if traveling southbound, Exit 30B if traveling northbound) to the Lowell Connector to Gorham Street (Exit 5C). Parking is available in the city garages. During the festival, all day parking is $15 at the Downes Garage (75 John Street), Roy Garage (100 Market Street), and Ayotte Garage (75 Post Office Square-Tsongas Arena). All day parking is $10 at the Lower Locks Garage (90 Warren Street), Early Garage (135 Middlesex Street), and the Davidson Surface Lot (Davidson Street off of East Merrimack Street). “Platinum Record” Parking Pass: 3-Day parking at any city garage above or the Davidson Surface Lot. $25. “Gold Guitar” Parking Pass: 3-Day parking at the Lower Locks Garage, Early Garage, or Davidson Surface Lot (no parking at the Downes, Roy, or Ayotte Garage with this pass). $15. A portion of all parking proceeds is donated to the Lowell Folk Festival. Schedules are subject to change, please consult these organizations before planning your trip. Festival Maps and Program Guides will be available starting on Wednesday, July 26 at the National Park Visitor Center at 246 Market Street. During the Festival, programs will be available at the Visitor Center and at information tents throughout the Festival (marked with a “?” on the map below). Hard Closures to be done at 3 PM Friday beginning with Merrimack at Dutton. Traffic to be re-routed to exit away from this area towards “drain” exits at Central Street, Kearney Square, and Market/Dutton. Merrimack to French Streets Fri. 3:00 PM to 10:00 PM. While in Lowell please patronize the fine Food & Beverage establishments in Downtown Lowell that are Sponsors of the Lowell Folk Festival.